As one of my guys loves to say, “She’s coming into it now.” The 1952 Riviera runabout’s seams will be Sikaflexed by this evening, painted by Thursday and begin wearing her hardware next week. We use white Sikaflex 295 UV, followed by high-gloss Total Boat Wet Edge topside paint. As RJ is Mr. Varnish, John is the guru of filling seams. Not surprisingly, as is the case with most everything else in delivering finishes to die for, it is all about preparation. It took John most of an afternoon to tape the aft deck and covering boards, and all morning today to tape off the foredeck. Why so long? Every edge must follow the seam’s shoulder precisely. 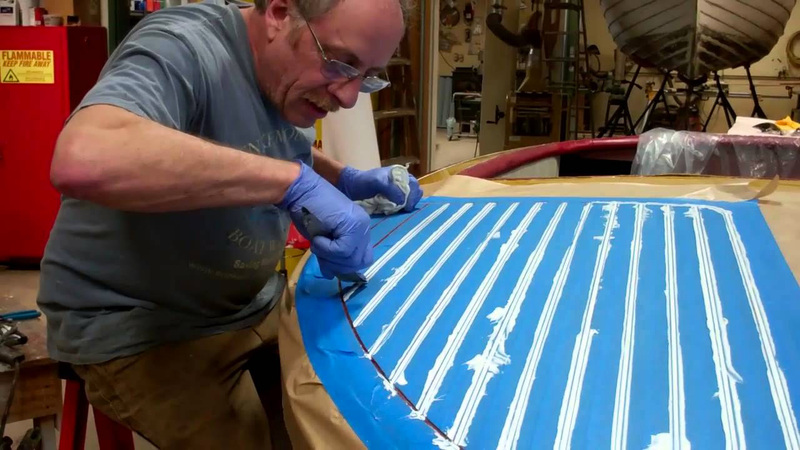 Using a utility knife blade and incredible patience, John slices slivers of tape away so that all arcs are perfect and all straight lines are exactly straight. He will be doing the ’46 Gar Wood Ensign once we apply the final coat of Pettit Hi-Build gloss varnish.